Wild moose spotting, artsy culture, wild forests and snowy mountains, Canada is an outdoor lover’s dream. 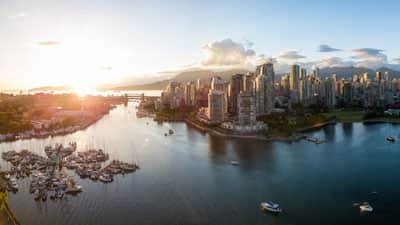 It’s no wonder Vancouver is considered the culinary and cultural capital of Canada, with the best Asian-dining in North America, a thriving art scene, and a shrine to the rock God Jimi Hendrix. Vancouver is a city that enjoys the finer things in life, as well as adventure and the outdoors. Get outside and discover the pacific northwest wonderland of forest trails, sea walls, sandy beaches, snowy mountains. Explore a world of adrenaline-pumping, winter sports at Grouse Mountain, also known as the “Peak of Vancouver”. Take the famous Skyride gondola up the side of the mountain, where you’ll find lumberjack and bird of prey shows as well as grizzly refuge. In winter, go snowboarding or skiing on this white, powdery playground towering above the city of Vancouver. Towering above, Grouse Mountain is known as the “Peak of Vancouver”. Go snowboarding and skiing on this white, powdery playground.